A government report says the U.S. approved $200 million in military sales from American companies to Bahrain in 2010, months before the pivotal Persian Gulf ally began a harsh crackdown on protesters. The yearly State Department report provides totals of U.S.-authorized arms sale agreements between U.S. defense companies and foreign governments. The latest tally showed a $112 million rise in licensed defense sales to Bahrain, home to the U.S. Navy’s 5th Fleet, between the 2009 and 2010 budget years. The U.S. had green-lighted $88 million in military exports to Bahrain in 2009. Much involved aircraft and military electronics, but the U.S. also licensed $760,000 in exports of rifles, shotguns and assault weapons in 2010. Since mid-February, the kingdom has confronted demonstrators with cordons of armed military and police firing live ammunition. At least 31 people have died and hundreds more injured in the clashes. The possibility that American-built weapons might have been used against protesters has raised questions in Congress and led the department to review its defense trade relationships with several Middle East nations. Some transactions are on hold and the review has broadened into a policy reassessment that could alter U.S. defense trade oversight. The State Department’s Directorate of Defense Trade Controls approved more than $34 billion in total exports from American defense companies to foreign governments in 2010. That compares with $40 billion in 2009. The total details only proposed sales, not actual shipments. It’s a reliable gauge of private sales of everything from bullets to missile systems, but doesn’t include direct defense shipments from the U.S. to its allies. The Obama administration has criticized the use of violence against dissenters by police and military units but has not exacted specific repercussions against Bahrain’s government. A military attache at the Bahrain Embassy in Washington would not detail the country’s contracts with U.S. defense companies and referred a reporter to the State Department. 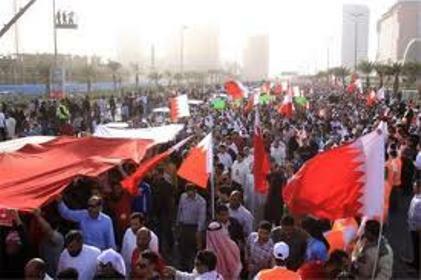 Department officials would not discuss specifics of the military exports to Bahrain. Among Bahrain’s recent military moves, the Congressional Research Service reported last March, were upgrading its small fleet of F-16 fighter jets and adding to its inventory of American-made helicopters. Anthony Cordesman, national security analyst with the Center for Strategic and International Studies, a centrist think tank in Washington, said the $760,000 in small arms licensed to Bahrain by the U.S. in 2010 was a pittance compared with what was sold in recent years to Mideast countries by European defense companies. Britain has suspended private contracts from British defense companies that previously exported armored cars, tear gas and other crowd-control equipment to Bahrain and Saudi Arabia. The new report showed that licensed U.S. defense sales to other Mideast and North African nations caught up in democracy protests remained mostly unchanged.